During this course, we will be rigging a creature that has some unique challenges not often found in your typical biped rig. 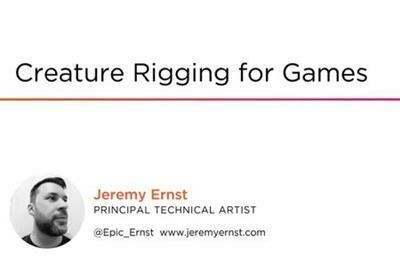 We'll be covering some more advanced rigging techniques that are intended to take your rigging knowledge to the next level. Have you ever been tasked with rigging something other than a human, and didn't know how to take your existing knowledge and apply it to the task? Do you want to expand your understanding of rigging so that you have the ability to tackle any type of rig? In this course, Creature Rigging for Games, you will learn how to build upon foundational knowledge to be able to tackle more unique rigging challenges. First, you will learn about the unique constraints when building a rig for games. Next, you will discover how to rig each aspect of the character, using some more advanced techniques that you can apply to future rigging challenges. Then, you will learn how to take a cloth simulation in Maya, and export it to something a game engine can use. Finally, you will explore how to finalize your rig for delivery by doing pose tests and testing your work in Unity. When you’re finished with this course, you will have the knowledge needed to create clean, professional rigs, that will work in a game engine.